What a handy quick-loader, a lead ball block for your muzzleloader rifle. These seven hole lead ball block quick starters are designed to be used with a shooting patch. A customer requested us to design a muzzleloader rifle seven hole lead ball block quick starter. This seven hole lead ball block quick starter is now our most popular lead ball block muzzleloader rifle quick starter design. We make these lead ball blocks for several sizes caliber muzzleloader rifles, including for 45, 50, or 54. Other sizes may be available upon request. These seven hole lead ball block quick starter are handcrafted from curly maple. 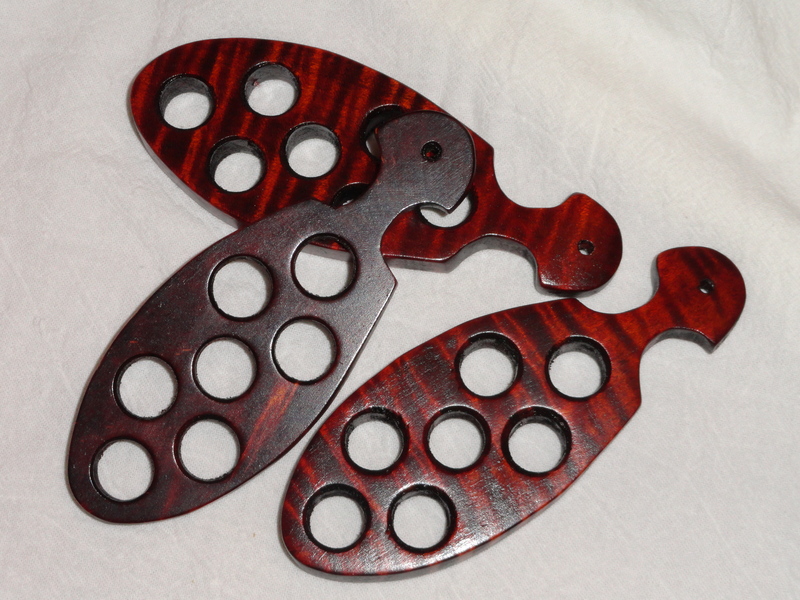 These seven hole lead ball block quick starter are hand stained and finished to bring out the most in their curls. As each block of wood is different no two lead ball block will be identical. Lead balls and shooting patches are not included. The seven hole lead ball block muzzleloader rifle quick starter is $25.00 plus sales tax and shipping.